Another chopped salad recipe from a 1999 BH&G. It's very good, kind of sweet and tart. Served it along with kalbi, and it will be a perfect foil for the rich grilled beef. Leftovers kept well chilled for a couple of days, although the colors ran a little. To make dressing: combine rice vinegar, oils, and sugar in a jar. Shake well before using. Blanch chopped snow peas in boiling water for 1 minute; drain and cool quickly in a bowl of ice water. Drain thoroughly. 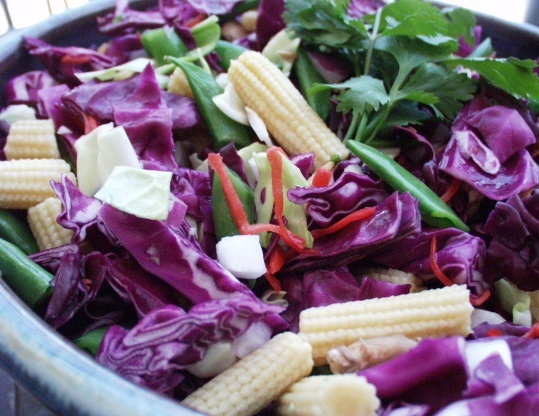 In a large salad bowl, toss together snow peas, cabbages, baby corn, onion, radish, and ginger. Drizzle dressing over salad and toss to coat. Top with enoki mushrooms, if desired.